What Are the Main Ingredients of Bath Soap? Bath soaps have many different cleansers in their formulas. 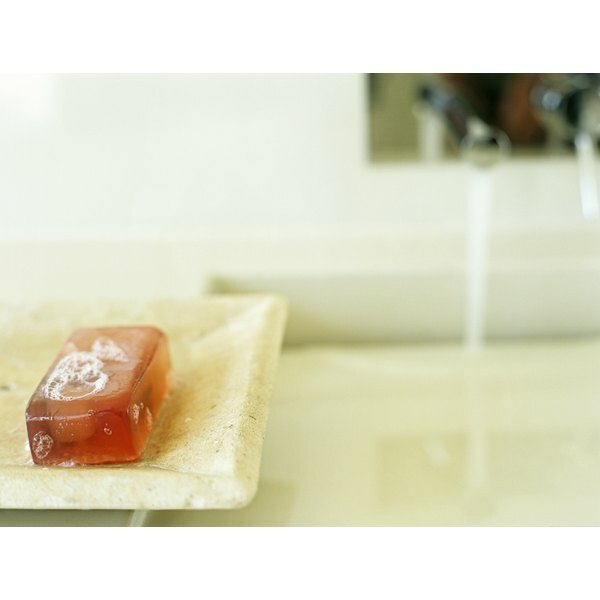 Bath soap is typically made up of moisturizers and cleansing agents that work together to soften skin and clean it. Depending on the brand, there can be more cleansing agents than moisturizers or vice versa. Checking the individual labels can let you know what detergent additives are included in that particular soap. Sodium laureth sulfate is a cleanser with high-foaming properties that make it useful for those with hard water. It adds softness to the skin and has been deemed safe to add to products by the Cosmetic Ingredient Review expert panel, reports Cosmetics Info.org. It can also function as a surfactant, which creates a smooth surface for the product to glide over. This surfactant action makes it a better cleanser because it enables the soap to have continuous coverage. Sodium palmitate is both a cleanser and an emulsifier, according to the Environmental Working Group's Skin Deep database of cosmetic ingredients. Emulsifiers make oil and liquid ingredients blend well together. Alabu online states that sodium palmitate is the salt of palmitic acid and creates a lather and cleanses well, but it could also dry out your skin. Sodium lauroyl isethionate works as a cleansing agent, an emulsifier and a wetting agent. It could be a drying ingredient. It is made through the sulfation of lauryl alcohol with a neutralization of sodium carbonate, and, while a good cleanser and degreaser, it may prove irritating to some sensitive skins. Sodium olivate is the salt of olive oil fatty acid, a natural product. The U.S. Food and Drug Administration has deemed it safe for use as an indirect food additive. Since it is a botanically derived cleanser, it is mild and safe for use, according to Cosmetics Info. Sodium cocoate is a soap detergent cleansing agent that is used in many shampoos and bar soaps. While it makes for a good lather and cleans well, it can also be a skin irritant and drying to some who have sensitive skin.